Looking at Priyanka Gandhi’s political credentials—except being from the Gandhi family and having campaigned for her brother in Amethi, she has none whatsoever—one fails to understand on what ground her appointment as Congress’ general secretary in-charge of east Uttar Pradesh is being seen as Rahul Gandhi’s masterstroke. Unless the Indian voters have become so naïve and unless the sectarian hatred spread by the Hindutva gang has evaporated to the extent that they would forget everything and flock to vote for a party for the single reason that it has a campaigner with a pretty face, calling her elevation a masterstroke is premature and unconvincing argument. Agreed that there exists a frustration among the voters. From casteism to unfulfilled promises the reasons of this frustration are varied. Let’s not forget the fact that the sectarian cancer infected by BJP on the body politic of India is there with almost same severity. Instead of going away it has only turned into casteism. Those who may have lost any charm in Hindutva slogans, will now vote on caste lines. At least in UP by shunning BJP its non-Rajput voters will go with Akhilesh or Ajit Singh and of course Mayawati. The states in which Congress has performed well did not have these caste-based parties. 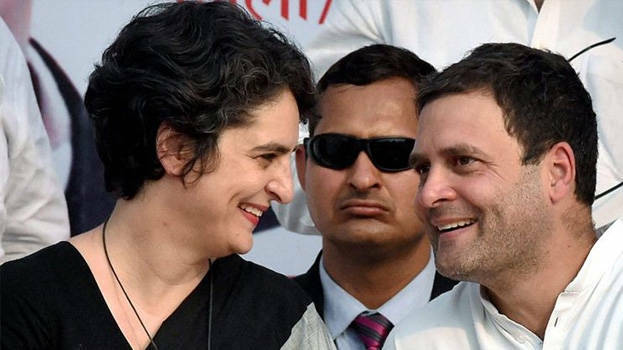 Far from being Rahul Gandhi’s so-called masterstroke, if Priyanka Gandhi— who once insisted that she was not Priyanka Gandhi but Priyanka Vadora, and now once again for political manaevoring reclaiming her surname, Gandhi— really succeeds in her new role this may in fact create problems for Rahul as well as the Congress in future. Politics and the taste of fame and power can turn even the saintliest people into vicious enemies. Examples of how rivalries in dynasties, be they dynestic monarchies or dynastic democracies, have turned even parents and siblings into vicious enemies are numerous in human history. It was only in 2012 that the Indians witnessed Akhilesh Yadav capturing party leadership and showing his father, Mulayam Singh, the way out. Before that tussle had been going on between him and uncle Shivpal Singh Yadav as well. In neighbouring Pakistan tensions between Benazir Bhutto and her mother, Nusrat Bhutto, and then also between Benazir Bhutto and her brothers, resulting into the murder of Murtaza Bhutto, allegedly organised by Zardari, are no secret. Priyanka Gandhi is being described as carrying a striking resemblance of her grandmother. In an interview she took great pride in having ‘the same blood’ in her as Mrs. Indira Gandhi. Well then, if so, she must also be carrying her grandmother’s ambitions and ruthless manners of side-lining her seniors and climbing high. In politics, hardly anyone remains safe from being ambitious. This reminds me of Kuldip Nayar having noted in one of his books that during the campaign to choose Nehru’s successor when Mr Nayar said to Lal Bahadur Shastari that he would probably leave the road clear for Mrs. Indira Gandhi, he retorted confessing to Mr Nayar that he was not a saint, as he was taking him to be.